Now Boarding is a vintage cocktail bar with its roots in the golden age of air travel. Evoking the zeitgeist of ‘Catch Me If You Can’ and ‘Mad Men’. 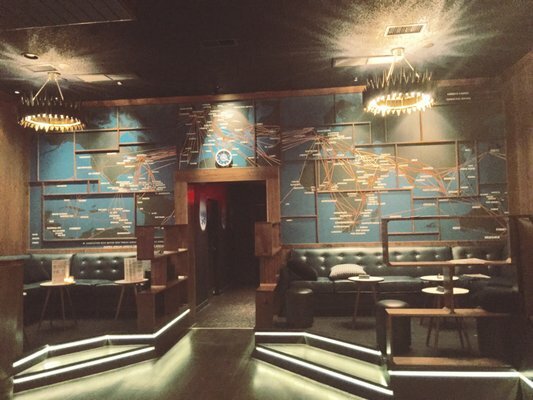 the bar delivers a First Class lounge experience without having to navigate the 405 traffic to LAX! With great service. a welcoming and accessible door policy and relaxed vibe. it’s the ideal place for a few cocktails early week. an intimate date night or an old-fashioned party on Saturday night! Now Boarding gets 4 stars from me. No real complaints, and I LOVE their menu. This is a very cool, unique experience, that offers a refreshing, unconventional twist to the bar scene. With an aviation theme, and airport terminal bar feel, this place is definitely a fun option for all. The servers are dressed up as flight attendants, and you truly do feel like you’re on a plane. While the whole experience was somewhat underwhelming, and slightly disappointing, the service was great, and overall we had a great time here. When I first heard about Now Boarding from a friend, I was extremely interested. I was very excited to try this place out, and it has been on my to-do list for about two months now. After all the hype and build-up, I must say, it at least met expectations, but barely. I really was expecting more from this place, and was a little let-down. I truly believe it has potential to be great, and it’d be awesome if they worked to improve it and add more decorations. The concept is there, but there really is a lot more they can do to make it better. The service here was nothing but friendly. From the bouncer, to the bartenders, the vibe here was positive. I really enjoyed my time here, and I would come back. Prices are about appropriate for this kind of a place, though slightly higher than I would have wanted. The menu is really cool, and very easy to follow. Lots of great options, and the drink selection was adequate yet simple. All in all, I would recommend this place to bar goers. While I was expecting more, it did deliver. Go ahead and give this place a try!